Mozzi the dog in a celebration of the little things that create happiness and positive thinking. 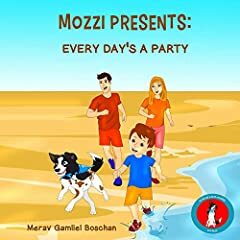 Mozzi's book series is kids dog books about an optimistic dog with a unique look and a sensitive, loving spirit. Mozzi lives in a village with his human family, surrounded by friends, nature, and love.